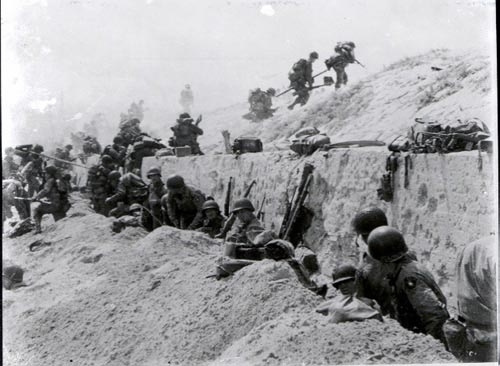 The following article on D-Day first-hand accounts is a guest post from Warfare History Network. Please visit their site for photos, maps, and first-hand accounts from history’s most important conflicts. A paratrooper, a beachmaster, a combat engineer, British commandos, and Vierville civilians all give their accounts of the Allied invasion of Normandy. The invasion of Normandy was one of the most audacious military campaigns in history. Nearly three million Allied personnel would participate in or support the Normandy operations. Operation Overlord landed 132,715 soldiers on the beaches and dropped approximately 20,000 paratroopers behind enemy lines. But what was it really like to live through Operation Overlord? 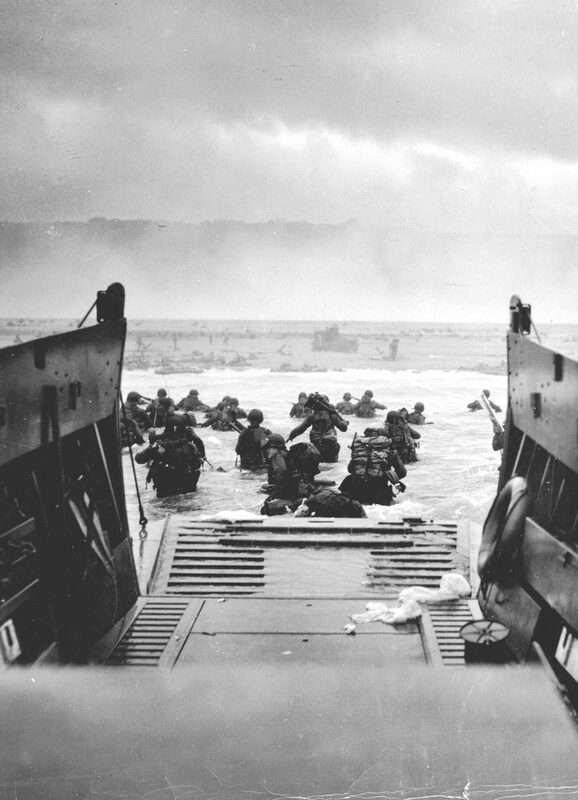 Here’s a glimpse at five stunning D-Day first-hand accounts. The diverse experiences they present capture the intricacies of Operation Overlord, the complexity of heroism, and the ubiquitous, horrific nature of war. 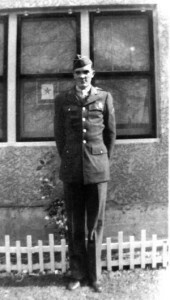 Portrait of Bob Nobles in 1943. D-Day arrived. In the late-night darkness of June 5, after receiving doughnuts and coffee from Red Cross Doughnut Dollies at RAF Station Folkingham, (Bob) Nobles and the rest of the men in the 508th’s 1st and 3rd Battalions strapped on their gear and weapons; Nobles also packed four letters from Bette. The men in Nobles’ stick then loaded onto a C-47 that belonged to the Ninth Air Force’s 313th Troop Carrier Group and roared off the tarmac shortly before midnight, heading for Normandy along with hundreds of other planes. When the red light by the fuselage door lit up the cabin shortly after midnight, Nobles and his 16-man stick stood up and hooked their static lines to the anchor cable running the length of the cabin and checked the preceding man’s equipment. Then the red light went off, replaced by a green one, and the men charged out the door. Nobles could see tracers coming up and trees below him, but he did not have time to take it all in. “By the time my chute opened up, I was on the ground,” he said. Nobles landed in a farmer’s field all alone and immediately unhooked himself from his parachute. He then removed the reserve chute on his chest, which was blocking him from his rifle. He threw away his gas mask, correctly thinking he would never need it. Relieved of this equipment, he took off on foot until he came across another paratrooper. “Don’t shoot! Don’t shoot!” shouted the man. “I’m from Kokomo, Indiana! I forgot the password!” Nobles just laughed at the panicked soldier. Nobles had no idea where he was, but he was not alone. Most of the 508th paratroopers had missed their drop zone because the unit’s pathfinders had run into trouble. Pathfinders were specially trained paratroopers who jumped prior to the bulk of the unit to set up guiding lights and Eureka transponders that communicated with the aircraft-mounted Rebecca airborne transceiver sets that told the pilots carrying the follow-on troops when and where to drop them. But the 508th’s pathfinders had jumped into the midst of the German 91st Infantry (Air-Landing) Division and took heavy casualties. The surviving pathfinders managed to set up only two signal lights and a single Eureka. 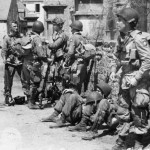 As a result, the regiment—like virtually every other airborne unit—was wildly misdropped; Nobles and his stick landed 10 miles from their designated drop zone. 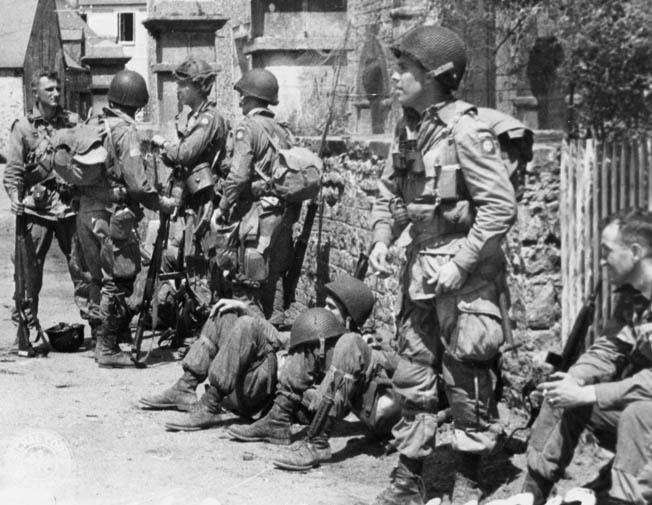 Paratroopers of the 82nd Airborne Division take a break during the fighting in Normandy. Nobles and his comrades fought for six straight days in the hedgerows. More disaster befell the 1st Battalion. 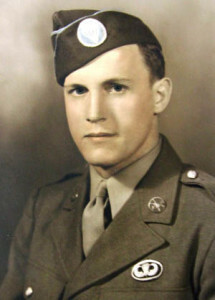 The 33-year-old commander, Lt. Col. Herbert Batcheller, West Point Class of 1935, was killed by a German machine gunner on June 6 or 7; a few days later, command of the battalion passed to Major Shields Warren, the unit’s executive officer. The townspeople of Vierville-sur-Mer awoke around 3 am on June 6, 1944, to the sound of bombs. In the early morning of the Normandy Invasion, American Consolidated B-24 Liberator bombers were dropping their payloads, preparing the invasion beaches for the coming attack. “I can still see a plane with fireballs,” recalled Andrée Oxeant, who was only 14 at the time. She may have been witnessing marker flares dropping from a B-24’s bomb bay. At the sound of the bombs, most people fled their homes for their backyards, where they had dug bomb shelters, covered with logs or corrugated metal. Some ducked to their basements, a few slept through the attack. Hardelay and his parents raced for their shelter, his mother grabbing her jewelry and money before entering. An aerial photograph taken by a Royal Air Force reconnaissance plane shows the Vierville Draw on June 30, 1943, almost a year before D-Day. 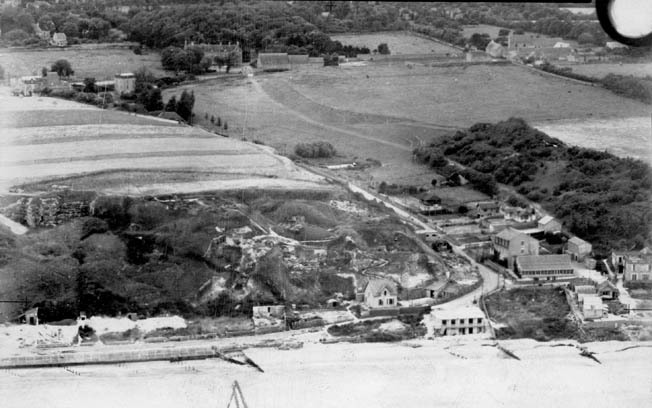 The houses around the U-bend in the road were demolished by the Germans and replaced by strongpoints, pillboxes, and Widerstandsnests. Most people brought nothing to eat or drink for their day-long stay. “We were very thirsty,” recalled eight-year-old Jean-Claude Ygouf, “and our lips were swollen from the shells blasting.” Twelve-year-old Jeannine Chamberlin and her parents rushed to a German horse shelter. “The German soldier took me on his lap in between the horse’s legs,” she remembered. As the sun rose, people could see ships in the English Channel, but Michael Hardalay could only see fog from his bedroom window. “All of a sudden, the fog cleared up and unveiled thousands of boats: a superb and grandiose sight!” He called for his mother, then his neighbor, to admire the armada. Colonel Moulton had the foresight to train his men to fire 2-inch mortar smoke from the bows of the craft during the run-in to the beach. The smoke screen hid the craft from direct fire, but beach obstacles and shrapnel holed the wooden hulls, killing and wounding troops and crews. 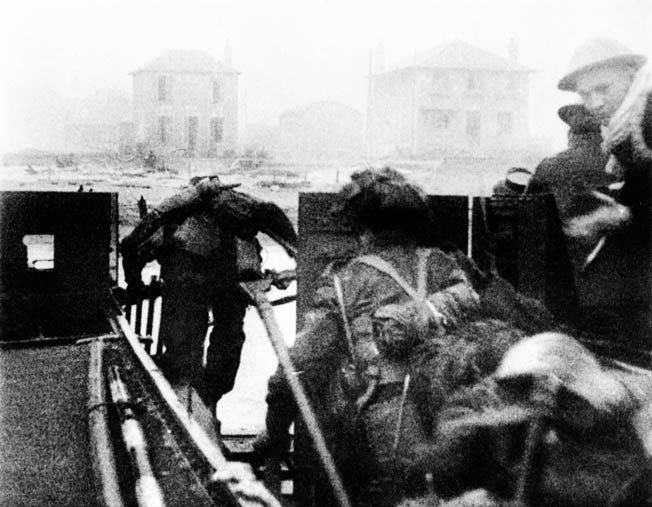 Making the initial landing at Nan Red Beach, on the left flank of Juno Beach, Canadian infantry disembark from their landing craft under German fire shortly after 8 am on D-Day. Most craft did not beach square on the waterline, exposing troops trying to scramble down the bow gangways that were constantly moving in the swell. Many marines were pitched into the sea to wade ashore in waist-deep water, while others were thrown in headfirst and were swept away by the fast-flowing current and drowned. Captain Geoff Linnell, commander of the Heavy Weapons Troop, witnessed a desperate scene: “The ramps were too light for the ends to sink to the sea-bed; they floated about in the surf. As each man tried to come down them, the footway beneath him heaved alarmingly with each incoming wave. Many men were thrown completely off the sides and floundered in the water, dragged down by their heavy packs. When I got down the ramp, there was a big sea and a great undertow that nearly took my legs away. Rencher’s three-man squad consisted of himself, Otis Hamm of Biloxi, Mississippi, and Dan Shellenberg of Youngstown, Ohio. “Hamm was the veteran,” said Rencher. 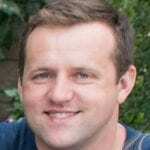 “He’d made all three previous invasions. He knew how to detect and disarm everything. Shellenberg and I were only 18 when we began training, and he made us as professional as he was. Hamm was a tough and demanding taskmaster. He knew that his survival depended on training the two younger men to do their jobs to perfection. He hounded them, pushed them, and beat them into becoming a well-honed team. As a veteran of the three previous beach assaults, Hamm had no delusions about the deadliness of their mission. There was little room for error. “He figured, based on his experience, that he would be the one of the three of us who would not be killed and that Shellenberg and I would be killed,” remembered Rencher. Their task required good ears, steady hands, and more than a little luck. “For each mine, we had to find the teeny-tiny detonator,” recalled Rencher. “We worked as a team. One of us had the mine detector, a disc about one foot across with a handle and a meter with a dial on it. There were earphones that would hum and the dial would tell you when it had detected metal. We had to detect each mine, we had to disarm them, and often the mines themselves were booby trapped. General [Field Marshal Erwin] Rommel had ordered 50 million mines for the beaches. At the time of the invasion, he had over 20 million of them installed. Nothing went as planned. In the predawn darkness, the craft carrying the tanks took longer than expected to form up, and the assault infantry hit the beach without armor protection. The various waves of landing craft became mixed up in the confusion. “Every landing craft was taking on water like crazy,” said Watson. LCVPs began sinking. Those that stayed afloat took enemy fire. “Landing craft were exploding around me.” Watson succumbed to seasickness and threw up. He was not alone. At least he could see the church steeple in Colleville, telling him he was on target. The enemy fire spooked the coxswain, who slowed his craft to a crawl. “Get to the beach!” the Army officers yelled at him. “Get this thing going!” Their reprimands worked. He gave it more power. That’s when Watson’s LCM, about 300 yards from the beach, hit the floating mine. He then hitched a ride from the LCVP and reached the carnage of Omaha Beach. Watson remembered what the general and the deck officer had told him about the signal boat and the battlefield preparations. None of it had come true. There was no control boat out in the water, there were no bomb craters on the beach to use as foxholes, and he never saw an Allied plane. Robert L. Watson survived the fighting on Omaha Beach and later guided landing craft to shore and escorted departing German POWs. Watson joined the firing line as ordered by the captain. About 300 yards to his right, he could see Germans running behind WN 62 to a reinforced hut, retrieving supplies. He loaded his wet ammunition clips into his rifle and took aim. “I was scared that the ammunition wouldn’t work,” he said, but he squeezed off his first shot without any problems. He then fired about 10 clips at the enemy. Company B sailors gathered just below WN 62. Out of the entire company, there were only 36 left. “A lot of our boys didn’t show up,” said Watson. One missing man was Lieutenant Wade. “He never made it to the beach.” …. You can find all of these stories and more on Warfare History Network.